NACOGDOCHES, Texas - A Stephen F. Austin State University alumnus has endowed a scholarship in memory of his brother, Ricardo J. Lozano. "I had the honor and privilege of receiving scholarships from the endowments established at Stephen F. Austin State University, and I was inspired by the giving of others, which helped me pursue my post-secondary studies," said Miguel Lozano III, Ricardo's brother and a 2004 graduate of SFA. "The creation of this scholarship allowed me to pay tribute to a beloved brother and an outstanding university." 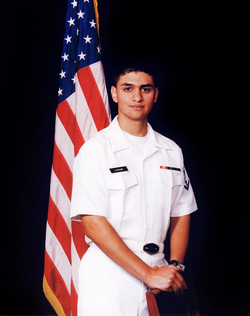 Ricardo was born in Falfurrias, Texas, in 1985, the youngest child of Mary and Miguel Lozano Jr. After graduating from high school in 2003, he enlisted in the U.S. Navy and joined the branch's nuclear program. In 2004, Ricardo became the proud father of a daughter, Hannah Marie Lozano. During his time with the Navy, he toured the Mediterranean and Middle East on the USS Dwight D. Eisenhower, assisting and supporting other branches of the military in the Iraq and Afghanistan areas. His daughter, Hannah, is his only surviving child. "The Ricardo J. Lozano Memorial Scholarship was created to honor the life of a beloved brother, son and father," Miguel said. "The scholarship was endowed as an outward sign of the tremendous love Richard shared with his family and most of all with his daughter, Hannah. I hope this scholarship will encourage future Lumberjacks to reflect on their acts of giving to their family, to their university, and most importantly, to those in need." This scholarship was endowed to benefit future Lumberjacks pursuing a degree in art or computer science - two of Richard's hobbies - as well as accounting, the study Miguel pursued while at SFA.